I’m a bit stunned and proud of myself. I loved to bake before I had to go gluten-free. I always used someone else’s recipe, though. I was never one to come up with baked recipes. Never. Since going gluten-free, I enjoy baking, but sometimes the long list of ingredients is a chore. Plus, I’m not fond of using refined gluten-free flours if I don’t have to. I am enamored with flourless recipes. The first one I came across was Carrie Forbes’ Gluten-Free, Grain-Free Peanut Butter Cupcakes. That was a year ago. I have the recipe printed off, but I have yet to make the cupcakes. Yes, I know. Then there were Shirley Braden’s Flourless Peanut Butter Cookies. To. Die. For. And so easy to make. My first attempts at coming up with a baked goods recipe didn’t fare so well. I still haven’t gone back to that cake. Yet. I picked up two pumpkins the first day I saw them in the grocery this Fall. I even had a conversation with my cashier about all the different ways she could use pumpkin. Oh, yes. Spreading the whole foods love. I cut them open when I got home, scooped out the seeds and set them aside to roast later and set the pumpkins in the oven to roast. Once they were cool and I was scooping them out to puree, I started thinking about cookies. Flourless cookies. I promptly went through my stash of nut butters, looking for the cashew butter. I figured since I find it tasteless, it finally has some use. Only I was down to about a tablespoon of it. I decided to use Sunbutter instead. I knew it was a risk, but if it worked, my cookie could be completely allergen-free. It really was a long shot. The Sunbutter overpowered the pumpkin and the spices. Completely. So, if you are nut-free and want to use Sunbutter, it can be done, but it won’t taste more like Sunbutter than pumpkin pie. Today, I made another attempt using cashew butter and totally fell in love. This cookie is completely grain-free, egg-free, dairy-free, soy-free, refined sugar-free. Pretty much everything but nut-free. And, it’s easier than pie. Preheat oven to 350. Line a baking sheet (or two if making the cookies small) with Silpat or parchment paper. Place all ingredients in a medium bowl and mix together thoroughly. Drop by small spoonfuls onto the cookie sheet(s) – the smaller the cookie, the better it stays together. Try to flatten out the dough as much as possible. The dough will be extremely sticky. Don’t worry if it’s not perfectly flat or round. Bake for 10 minutes. Remove from the oven immediately. Take a spatula and flatten the cookies more as soon as you take them out. Let them sit on the pan for a few minutes, then transfer to a rack. They are delicious right out of the oven, but will hold better if you let them cool before trying. The texture inside the cookie will be moist just like pumpkin pie. This post is linked to Wellness Weekend at Diet, Dessert & Dogs. This entry was tagged cashew butter, dairy-free, egg-free, gluten-free, grain-free, pumpkin, pumpkin pie, pumpkin pie spice, pumpkin puree, refined sugar-free, soy-free, Sunbutter. Bookmark the permalink. Totally briliant! You know how I love pumpkin pie. BTW, has Chaz tried these yet? 😉 I think this is the beginning of many Debi-created recipes. Well, I hope so anyway. 🙂 And thanks so much for the link love and kind words, dear! My son is allergic to cashews, would other nut butters work as well? Do you have a recommendation for another less overpowering nut butter I could try? I think hazelnut or pecan might work. You might try tasting the dough before dropping it and seeing if you can adjust the spice a bit to make sure the nut butter you use isn’t taking over. I get coconut crystals from Whole Foods and palm sugar online. I get Navitas brand palm sugar. Bookmarked! Only thing is, I’m allergic to all nuts but peanuts. Do you think peanutbutter can sub for cashew butter? You’re not allergic to peanuts because they are actually a legume. You could try SunButter and just add a lot more spice since the SunButter is overwhelming the pumpkin taste. I was thinking about mac nut butter, too. It’s pretty hard to find here. I’ll be looking for it when I’m home in a few weeks. 😀 I love this time of year,too! Oh, I’m all over these. Making them today for sure. Thx!!! 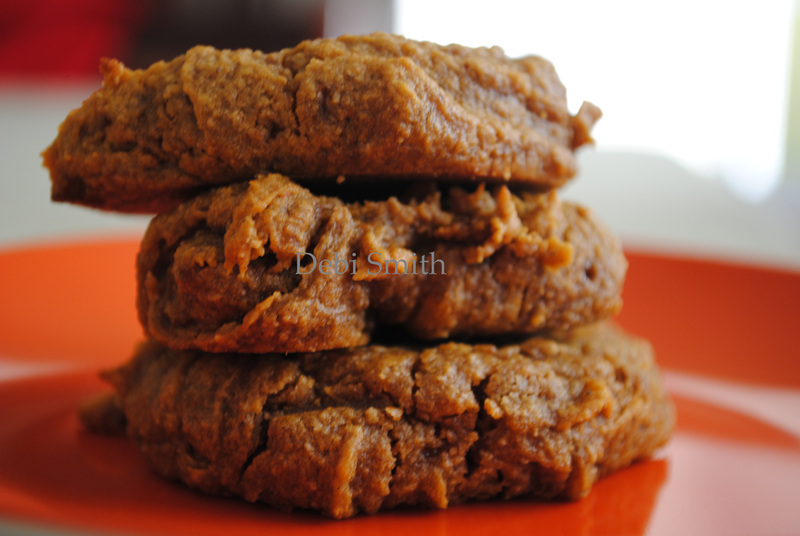 Love how simple this grain-free, gluten-free cookie recipe is! LOL I’m thrilled I made someone dance in their chair. 😀 I hope you like them as much as I do! I’m sure they would be good with almond butter, but I find it is a pretty strong flavor. Like I suggested to others asking about using other nut butters, if you do use it, taste the dough and adjust your spices if the nut butter is over powering. I was thinking about this recipe and thought what about pumpkin butter. What do you think? Would it work? If you are subbing the pumpkin butter for the pumpkin puree, yes, it would work. If you are subbing it for the nut butter, I don’t think it will. These are awesome – perfect timing for pumpkin season! Congratulations on such a delightful discovery! What exactly is coconut crystals or palm sugar? Can I substitute raw sugar in place of it? Coconut crystals and palm sugar are types of unrefined sugars. I love coconut crystals because it’s tapped right from the tree and is a highly sustainable product. You can sub regular sugar, but use a little less of it. yummmyyyy.. and brilliant! need to make these asap! I made these with almond butter and wish I would’ve tasted the dough because the almonds did overpower the pumpkin flavor. I will try this next with hazelnut butter. I was going to make my own cashew butter and try that but I saw that the hazelnuts were cheaper, so I’ll be making hazelnut butter and trying this recipe again. Hazelnuts and pumpkin would go very well together, I think. Oh, and I put extra dark chocolate chips in the first batch too. I think it was a good addition. These look wonderful!!! I love a simple baked good recipe that doesn’t use a combination of 8 different gf flours! This recipe looks yummy. What about soynut butter? My husband is allergic to nuts, peanuts and several seeds including sunflower seeds. Mistie, I do not use artificial sweeteners and don’t know how they would do in the recipe. If you choose to try to use Splenda, cut it in half at least. Or add it in last and go a teaspoon at a time. These cookies are good. Mine were flat and gushy in the center. I liked them but my family thought they were not so tasty. I had to add chocolate chips to them for my girls to eat them. How can I make them more like your picture? I used fresh pumpkin and the nut butter that you suggested. I need help. I like chewy and less moisture in the center. The batter was more runny than sticky. Jen, there are many factors that could contribute how your cookies turned out. The moisture content of your pumpkin puree could be high. The oil content of your nut or sunflower butter could be high. If you used honey or another liquid type sugar, that would drive up your moisture content. Your oven may bake at different than mine and you might need to alter your temperature. You might need to leave the cookies on the sheet longer than I did before transferring to your cooling rack. Since these are egg-free, if you can do eggs, you could try reducing your pumpkin to 1/4 cup and use one egg or keep the recipe as is and add an agar agar-egg. Basically, without being in your kitchen, I really can’t say for sure how yours turned out runny. Thank you for responding. I will redo these and try your suggestions! Thank you !